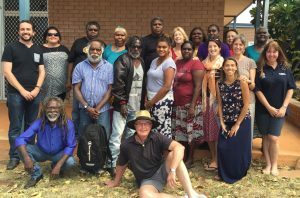 The report and action statement were recently published by the Australian Government funded, Whole of Community Engagement (WCE) initiative within the Office of Pro Vice Chancellor – Indigenous Leadership (OPVC-IL) at Charles Darwin University (Shalley and Stewart). The report was launched in Darwin on 12 September to representatives attending a pre-conference Symposium on the topic as part of the Australian Council for Adult Literacy’s (ACAL) 2017 national conference. The report, an activity of a WCE Strategic Priority Project (SPP), is one of the actions outlined in an Action Statement arising from a November 2016 workshop where over 80 participants agreed that there is a significant policy and service gap, and a need for an Indigenous-led, bi-partisan, collective and sustained responses linked to successful models and approaches. An updated version of the Action Statement was agreed at this Symposium, and released to government and the public on the 14 September. Read the Action Statement, the Statistical Overview and the Workshop Report here.